Although manufacturers have progressively improved its efficiency, the process suffers from relatively high heat loss from the electrolytic cells, as well as high CO2 emissions from the anodes. The Bayer process also has negative aspects, such as the production of large amounts of basic red sludge that has to be disposed of. 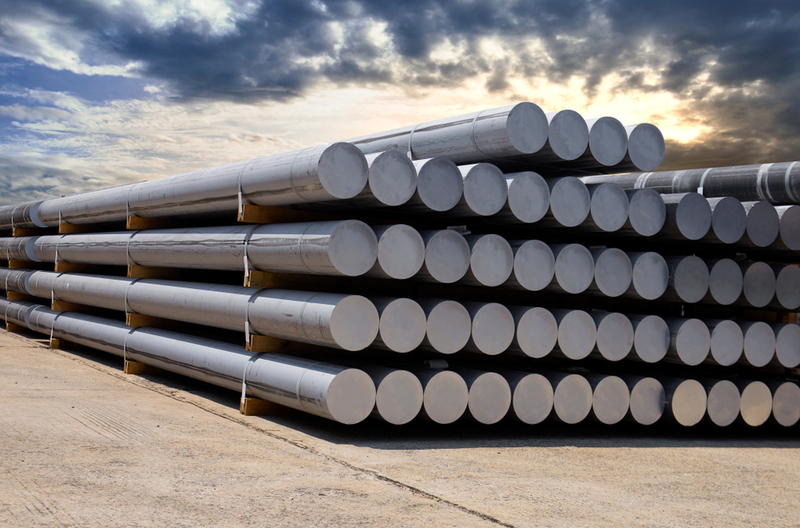 Because of the relatively high energy consumption and carbon footprint resulting from consumption of the anodes, alternative aluminium production methods have been under continuous assessment. Also, the Hall-Héroult process is approaching its theoretical minimum energy consumption and CO2 emissions. The chloride process is one of the alternatives considered, and is being reassessed at the HighEFF Centre for Environment-Friendly Energy Research (CEER), where a summary of earlier research has been compiled, that will now form the basis of SINTEF’s future activity in this field. The chloride process was developed by Alcoa from the 1960s and into the 1980s. Alcoa’s process is based on the chlorination of refined aluminium oxide resulting from the Bayer process. Aluminium chloride is then dissolved in a molten salt bath and subjected to electrolysis using graphite electrodes, which in this process are inert. The advantages of the chloride process are that it is more compact and that it takes place at a lower temperature than the Hall-Héroult process, typically at 720°C. The process uses inert anodes, in contrast to traditional electrolysis in which carbon anodes are consumed. All in all the chloride process can be carried out with lower energy consumption (9.6 kWh/kg Al) compared with the 13.4 kWh/kg rate for the Hall-Héroult process. Production of aluminium chloride by chlorination has no requirements on the mechanical properties of the carbon, which here is merely a chemical reactant. For this reason, biocarbon can be used, in contrast to the Hall-Héroult process, which needs anodes with high mechanical strength and density, and thus uses coke sourced from petroleum refineries. Carbochlorination can produce fairly high CO2 concentrations in the process gas, making it easier to implement CO2 capture and storage. In practice, the chloride process has not been able to compete with the Hall-Héroult process, and little information is available on industrial experience with the method. The chloride process is adversely affected by raw materials impurities; a number of unfortunate side reactions can occur, and gaseous chlorine compounds are generally toxic. For example, the formation of chlorinated alkanes (PAHs) and biphenyls (PCBs) has been reported, although temperatures are too low for the formation of dioxins. In the same way as in the Hall-Héroult process, the presence of moisture may result in unwanted reactions. At around the time of the launch of the Alcoa process, a good deal of research was carried out into both the process itself and the chlorination of raw materials. Interest later declined but has now been rekindled. The chloride process does not require the use of pure aluminium oxide exclusively as a raw material. This means that one may be able to omit the Bayer process, thereby avoiding the problem of disposing of large quantities of red sludge resulting from that process. In principle, direct chlorination may be performed on many minerals containing adequate amounts of aluminium. Naturally one would prefer to use minerals where the aluminium is weakly bonded thermodynamically, such as the clay minerals bauxite and kaolinite, as well as the alunites (hydrated aluminium sulphates). However, there are reports of successful tests using leucite-type minerals. This is interesting in a Norwegian context since these minerals are related to anorthosite, a member of the plagioclase feldspar series occurring in rich deposits in Norway. Anorthosite is a mineral in the plagioclase series of aluminium silicates with varying content of calcium and sodium. In the chlorination process, calcium and sodium will be chlorinated first and will remain in the charge as solids. Aluminium is then chlorinated to AlCl3, which is gaseous at temperatures above 180°C. Corresponding processes can be used for other feldspar minerals. Anorthosite contains little iron, which is an element that can cause problems during chlorination. Bauxite is the principal raw material used for global aluminium production. It contains a large amount of trivalent iron oxide, and the associated chloride is so stable that it can be formed by the back reaction between Fe2O3and AlCl3. In other words, it consumes the product we require. Hence it is important to remove iron effectively, and rapid chlorination of iron is therefore ensured by performing an activating stage that converts iron oxide to iron sulphide. This is done by first suphidising iron to FeS by adding SO2/CO, and then chlorinating the iron to divalent iron chloride, which has a high melting point. Aluminium is then chlorinated and extracted in gaseous form as AlCl3. Bauxite also contains titanium, which is also chlorinated to low boiling (136°C) TiCl4, which must be boiled off before the aluminium is chlorinated. Kaolin is a clay consisting of hydrated aluminium silicate (kaolinite). Kaolinite-rich clays are activated by adding ammonium sulphate, which separates aluminium from the silicon. The chlorination of aluminium is also favoured over that of silicon. A potential energy saving of 25-30% compared to the Hall-Héroult process, and easier CO2 capture and storage, will be very important in the context of the green transition. As time passes, it may be useful to revisit the old process, because once in a while new opportunities for profitable operations do arise. Read more about SINTEF’s contributions in the fields of metal production and processing.